My Genealogical Quest. What Comes Next? As I sit here on my flight home to the United States cramped in coach seat 50A somewhere over the Atlantic Ocean, I can’t believe the events of the last 10 days. Even if I was an amazing writer (which I’m not), I could never fully express the feelings and emotions that I’ve felt during this trip. The connections that I have made with family and friends are mind boggling and I cannot express that in words. Friday morning was our last day in Lithuania. How could our time here already be at an end? Again, two main things on today’s list. The first was an item that I had been looking forward to for weeks. Our guide had located the author of the 2-volume Nemunaitis collection and had arranged for us to meet with him directly. In addition, Thursday night, Albertas had called our guide again and was disappointed that we didn’t have much time to spend together during our day in Vabaliai. He offered to show us around Friday afternoon after our meeting with the historian. item that I had been looking forward to for weeks. Our guide had located the author of the 2-volume Nemunaitis collection and had arranged for us to meet with him directly. In addition, Thursday night, Albertas had called our guide again and was disappointed that we didn’t have much time to spend together during our day in Vabaliai. He offered to show us around Friday afternoon after our meeting with the historian. Friday morning we were scheduled to meet Sigitas at 11AM. With two hours free in the morning our guide gave us a tour of a few of the highlights of Vilnius. I honestly have to say that of all the days that we were with him, these two hours were his best. 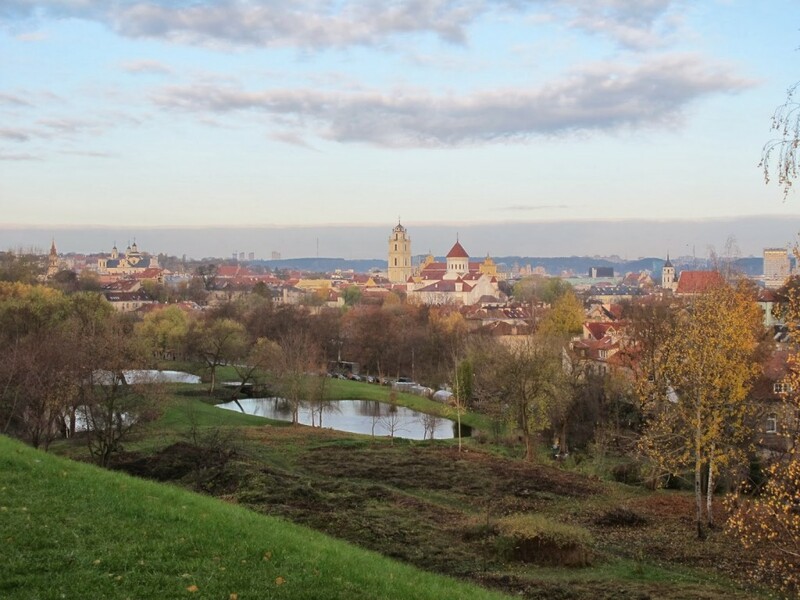 He brought us to a lookout spot where we could get a great view of Vilnius and take some pictures. He also gave us a tour of Uzupis, which is a small section of Vilnius that is its own republic and reminded me a lot of the North End of Boston, but with an artsy flair. Lastly, he gave us a tour of the Cathedral in Vilnius and a quick drive by of a few other sites on our way to the restaurant to meet Sigitas. On Thursday, we had only two items on our to-do list. First we would go to Kalvarija where I suspect one part of Amy’s family is from. We would visit the local church and ask around for any leads about the family name: Jeseliunas. Second, we would go into the “Old Town” of Kaunas and meet a friend of mine for lunch. At the end of the day, we would make our way to our final hotel in Vilnius. My Genealogical Quest. Into Lithuania We Go! Last night, before we were dropped off at our first Lithuanian hotel by our guide, we had to drive from the border to Alytus. Although he was quirky, our guide was pleasant. I was most excited when, within minutes of getting in the car, he handed me a plastic bag containing two books. These two books were written by a historian who lived in Vabaliai (the village where my Maslauskas ancestors had lived). Two, 600 page books, specifically written about the Nemunaitis Parish. The only downside – I now had 1,200 pages of information written in Lithuanian. Well, you can’t expect everything, right? My Genealogical Quest. Tuesday and the Race is On! After a very long drive from Tarnów to Warsaw the night before, we piled back into the car for another 4 hour drive to Lipsk and Kopczany to visit Wojtek and his family. 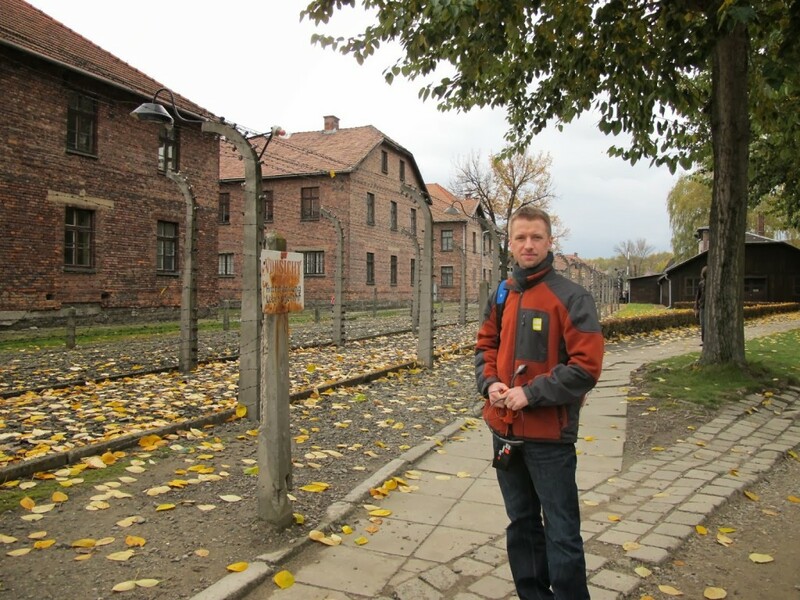 Wojtek and I were put in touch a few years ago by Joe Baxer who visited the family about 20 years prior. Wojtek and I are not related by blood, but share family connections through Antonina Danilczyk, my great-great grandfather’s second wife. Joe recently visited them again this past spring. For the last few years, Wojtek and I have been exchanging information on family members over the internet and have been eager to meet each other in person. Our main goal for Monday, October 21st was simply to make a brief stop in Leżajsk in an attempt to break up the 4 hour ride from Tarnów to Warsaw. I had previously found a birth record for a great-great uncle and a few unknown siblings showing they were in fact born in Leżajsk. The records online, where I found this information, begin at 1892 and only contain a few years. Unfortunately, there are additional records online for this location, but I had been unable to find any birth records for siblings born before 1892. There were probably two reasons for this: The first was that the family could have been located in another village and subsequently moved to Leżajsk around 1892, or the second reason could be that the records online where for a small village near Leżajsk and are mislabeled. After finding all of that information in the Odrzykoń parish records, I was very eager to return the next day to attend mass and explore the town. We left our hotel in Tarnów just before 9:30AM to begin the one and one half hour drive back to Odrzykón where we would attend the 11AM mass. As we drove through village after village, one of the things that I noticed was that all of the churches had groups of people gathered outside around the exits. Asking Zenon why the people were waiting outside the church, he stated that many people prefer to worship outside the church itself rather than inside the building. Most churches have speakers above the entry doors so that the entire mass can be heard outside. As we drove through town after town, each church had gatherings of people at each door where the speakers were located. Interesting! After finding these relatives in Pawłów, I could have gone home content. I cannot fathom how anything could top this experience. Leaving the village, we would now travel to our next location: a village where my maternal grandfather’s family lived – Odrzykoń. We had originally planned to go to Odrzykoń tomorrow (Sunday), but when Zenon called to speak to the priest, he stated that it would not be possible for us to meet with him this Sunday. Sunday’s are generally very busy and he had an event to attend after the Sunday masses. Zenon, always able to adjust plans at the drop of a hat, made an appointment for us to meet with him after a 5PM rosary mass that evening (Saturday) instead. Today was very different than yesterday. Rather than focusing on death, hardships, and war at a very sad place, I journeyed to 2 towns were my ancestors lived over 100 years ago. Bolesław/Pawłów and Odrzykoń. My Genealogical Quest…and so it begins: Day 1. After two uneventful flights (thank goodness), Amy and I have arrived in Kraków, Poland.